Artificial Wreaths for sale – although we add a range of artificial wreaths and artificial swags at Christmas and New Year we always have a range like the artificial wreaths here. We have wreaths and swags for every season, for everyone and for every budget. Be it the autumn harvest or be it Christmas and New Year, be it a wedding or you simply wish to deck up your front door with a pleasantly colorful wreath. Needs are always diverse and personal, so are our wreaths and swags. In our blog specifically dedicated to for the graveside. 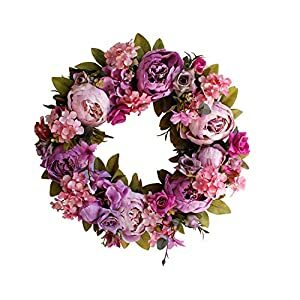 wreaths and swags, we discuss floral silk swags and artificial wreaths, how you can pick the best of them and we also talk about their history so you can get to know more than what meets the eye. The history of using wreaths is long – they symbolize eternity (the circle with no end nor beginning). The Romans used to put a wreath on their front door to symbolize victory now is is believed they are used on the front door to symbolize the crown of thorn worn on Christ´s head and the berries, his blood. Naturally some of wreaths bought here are for the silk grave arrangements graveside. They can be on a headstone, using an easel or on a hanger. With seasonal artificial wreaths Thanksgiving (Fall) wreaths are hugely popular. You can hang them on your front door, on indoor walls and even a small version on your letterbox! They come in all the Fall colors like rust, brown, orange using maple leaves, pine cones and red berries. If you like you can even use them for wedding decorations. These wreaths are also often called harvest wreaths and can often be used for halloween. They come in a wide range of sizes colors and varieties of flowers. Prices are always competitive and quality only top class.